The 25th Street Band is a duo that emerged from London's Jazz Rock/Funk circuit of the 80s and early 90s. Consisting of guitarist/keyboardist Russ Klinger and keyboard player Dave Radnor, the group has back up a number of popular UK singers, including George Michael. 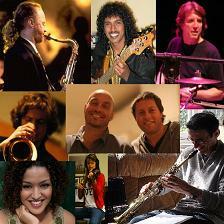 In 2007, the duo released The Key of H, with guestwork from top shelf musicians including Tom Brechtlein, Hussain Jiffry, Mornington Lockett, David Bitelli and Henry Armburg Jennings and vocalist Jandira Silva.